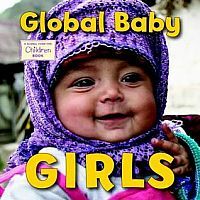 Continuing in the tradition of best-selling GLOBAL BABIES and AMERICAN BABIES, GLOBAL BABY GIRLS puts baby girls from around the world in the spotlight, celebrating their strength, diversity, and potential. From Peru to China, from Russia to Mali, this board book features captivating photographs of baby girls to share a simple, yet powerful message: no matter where they are born, baby girls can grow up to change the world. Baby girls are precious, but they are not valued everywhere. It’s never too early to introduce the importance of girls, and the power they can have in the world.